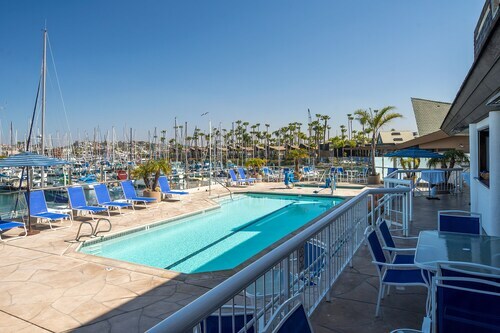 Located in Little Italy, this hotel is within a 15-minute walk of Waterfront Park, Port of San Diego, and Balboa Park. B Street Cruise Ship Terminal and Maritime Museum of San Diego are also within 15 minutes. County Center - Little Italy Station is only a 4-minute walk and America Plaza Trolley Station is 9 minutes. 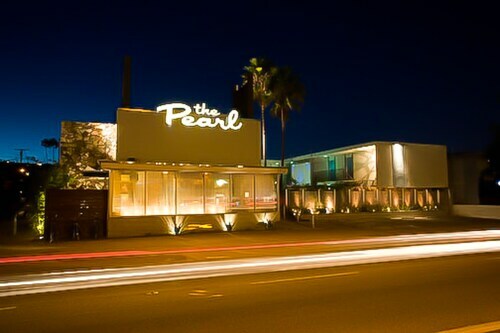 Set 2 blocks from San Diego Bay, the Pearl Hotel is a 15-minute drive from both the Gaslamp Quarter and SeaWorld. San Diego International Airport and Mission Beach are both about 3 miles away. 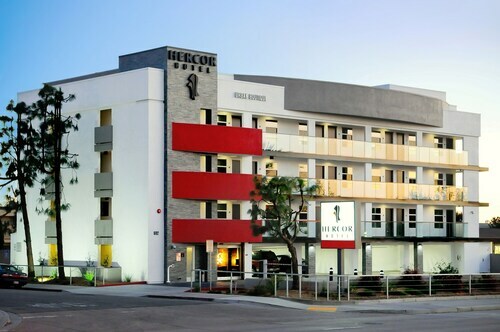 Situated in Chula Vista, this boutique hotel is 0.5 mi (0.9 km) from Chula Vista Center and within 9 mi (15 km) of Petco Park and Balboa Park. 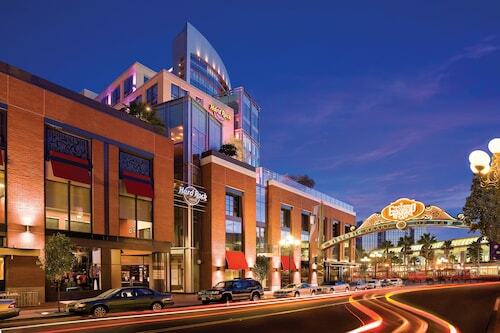 San Diego Convention Center and Seaport Village are also within 9 mi (15 km). H St Trolley Station is only a 3-minute walk and Bayfront - E St. Trolley Station is 25 minutes. 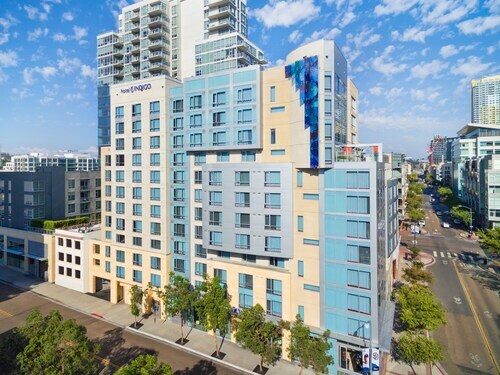 Located in Downtown San Diego, this boutique hotel is within a 15-minute walk of Petco Park and San Diego Convention Center. 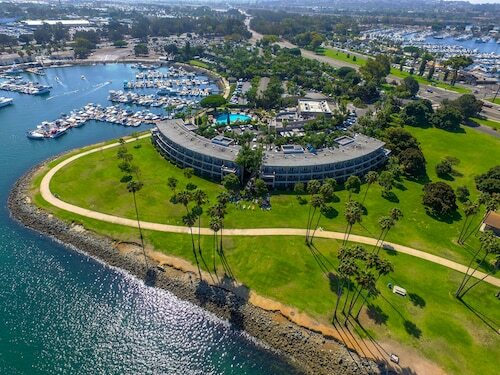 Seaport Village and Balboa Park are also within 1 mi (2 km). Park and Market Trolley Station is only a 5-minute walk and 12th and Imperial Transit Center Station is 10 minutes. 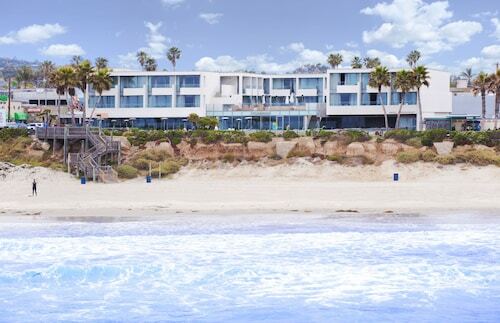 Situated by the ocean, this romantic hotel is within a 15-minute walk of Museum of Contemporary Art San Diego and La Jolla Cove. Windansea Beach and La Jolla Shores Park are also within 3 mi (5 km). 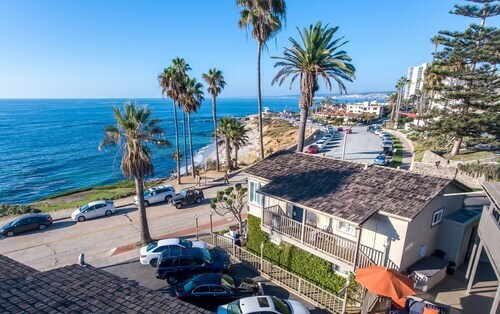 Located in the center of La Jolla Village, surrounded by fine shops, museums, and restaurants, this historic Mediterranean-style hotel sits atop La Jolla Cove and has sweeping views of the Pacific. 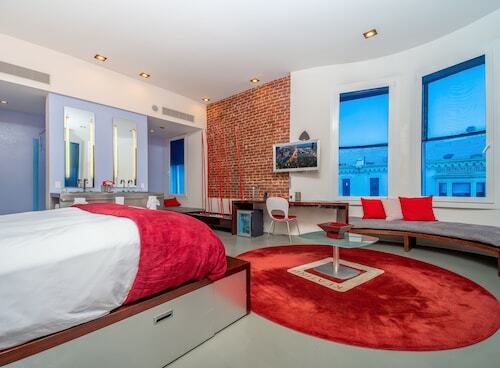 Boutique hotels vary from charming and romantic to artistic and just plain quirky. The one thing they typically have in common is delivering an upscale, intimate vibe with personalized service and ultimate comfort. 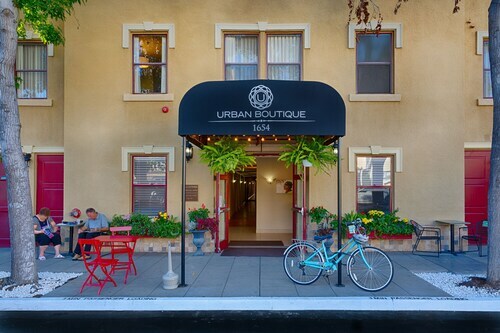 For the refined traveler or those looking for that special something, boutique lodging is a great combination of both individualized and traditional amenities. 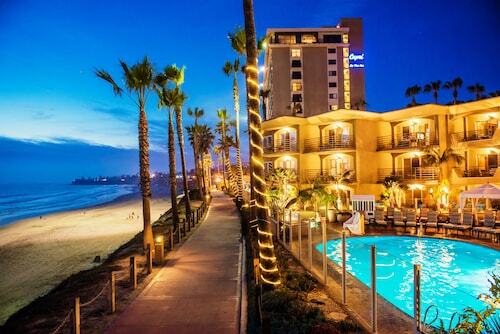 Let your imagination run wild, then turn to Travelocity to help you find the best boutique hotels in San Diego County. 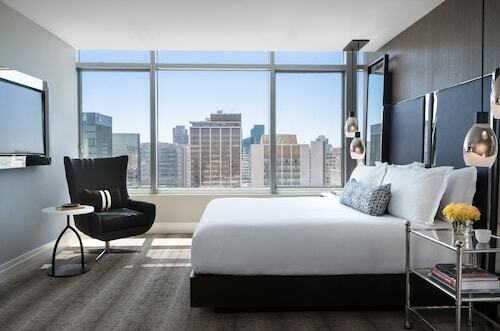 Sample the local cuisine, tour the sights, or enjoy a night on the town—then retire to your room, which likely has high-quality linens, luxurious bath products, and custom furniture. Perhaps you’ll sip cocktails or listen to live music at a social event, where you can mingle with other guests in a hip yet casual setting, like the library. 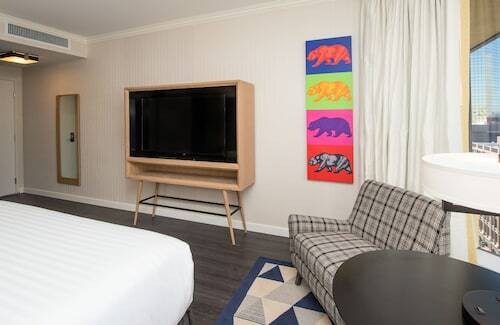 Or simply admire the ambiance of the design, lighting, art, and architecture—as unique as the guests themselves in many San Diego County boutique hotels. 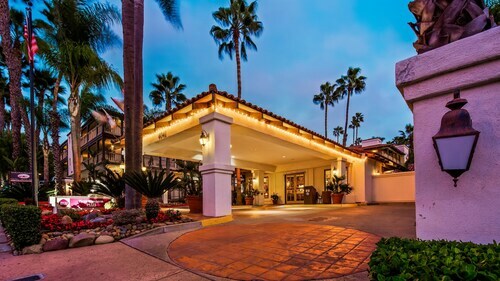 Explore the boutique hotels in San Diego County to discover your perfect match, then get ready for a memorable and authentic escapade. 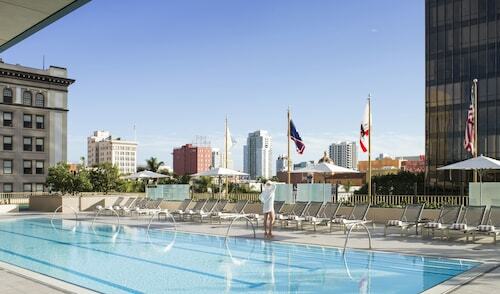 In just a few minutes, you can reserve a vacation with all the right touches. Book with Travelocity today for the best prices and customer service. Old Town is unique in itself and this hotel fits right in. It’s grounds and outdoor seating areas are lovely. Parking is pricey but worth it as you can walk everywhere in the area. The trolley can take you to other parts of the city. The grounds were beautiful. The staff were all helpful and efficient. The front desk staff went above and beyond to help me when my rental car was stolen. Close to everything. Loved the quaint look and feel of the hotel overall. The staff was friendly and we loved the complimentary water. Really the only downside was the space in the room. The wardrobe door didn’t open all the way due to the placement of the nightstand which made it difficult to utilize. Despite the “coziness” we would still recommend The Sofia as it’s location is fantastic especially if your destination is the Gaslamp. 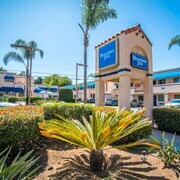 Great Location for access to Downtown, Seaworld, and Ocean Beach areas, without being crowded or having to deal with traffic. Shelter Island is a cool semi secluded area that is centrally located. 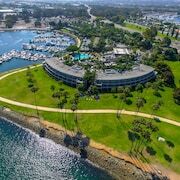 The Bay Club is not overly fancy, clean moderate sized rooms, and very friendly helpful staff. Good restaurant and bar attached to the lobby, both have a friendly local feel. Free Shuttle to other nearby restaurants, or even downtown for less than what parking will cost you. We had a second floor marina view that was great. The pool and spa area was clean. Over all we had a great stay and would stay at the Bay Club again in the future. 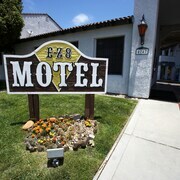 Decent hotel located around the corner from the Civic Center, Lyceum theater and other cultural venues. Other than the meeting and party space, the bar and dining room areas were relatively small. Dinner was outstanding, the quality and service for breakfast was sub par.